striped midi dress from Fancy Frills Boutique. 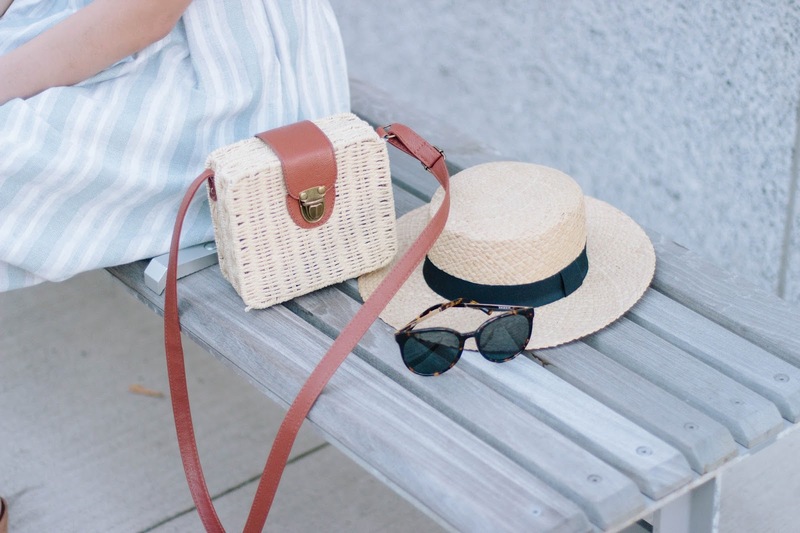 while the straw bag and panama hat gives it a beachy vibe to keep it casual. By the way, did you know you can win a $1000 Nordstrom Gift Card? Head to this post to enter to win! 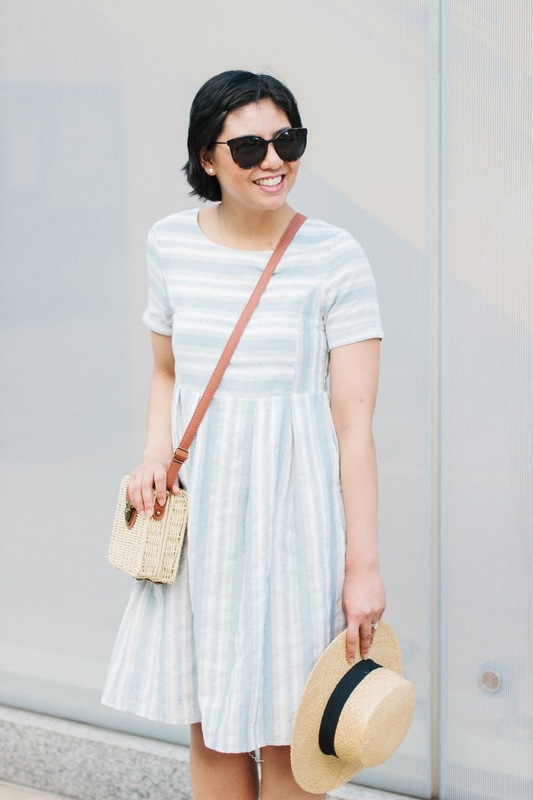 Such a cute dress and love that handbag! I LOVE this dress! So perfect for summer, and your accessories are on point! Thanks Amy Ann! You would look amazing in this dress! Not only is this adorable, but it looks super comfy! CUTE! Aw thank you so much Andrea! I adore this soft, subtle stripe print for spring! So airy and light! I love this dress!! It's such a bummer that we only get a few months of warmth before busting out the sweaters. Lol. I'm not loving this cooler start to summer. I see the forecast says we're looking at June nights in the 50s for at least the next week or so… boooooo!!!! Ha ha!! At least our daytime weather is GORGEOUS! Like you! I like the pastel tone of the dress! Very nice pick. Love this dress! So adorable! This is such a perfect throw on and go dress Rach! And I love, love that bag! So great catching up with you last week, we need to do it again soon! Thank you so much Heidi! It was really great catching up! Definitely need to do it again soon! That dress is so perfect for summer and it looks great on you! I hope you had a great long weekend! Thank you Nicole! I hope you had a great one too! I absolutely love your dress! The stripes are so flattering! So cute! Love the hat paired with it! This midi dress is so cute! Really sweet! It's turning to winter here in Australia so I can't wait for warmer days when I can wear fun dresses like this one again! Enjoy your summer! Oh no! Stay warm girl! Thank you Gina! Loving this dress! Such a classic piece for summer. my two favourite things: simple & elegant! You rock!! 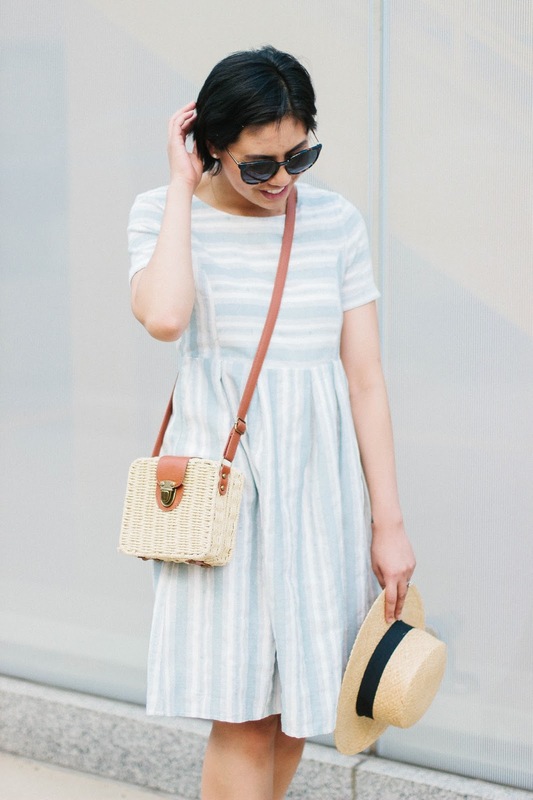 This is the most perfect striped dress. I love the simplicity of it! This is such a perfect outfit for summer! How stinking adorable is this dress on you! I love how you styled it and added in the bag! So fun! Aw I love this dress! It's so perfect for summer days. Your accessories are so pretty here — love that bag. This is such a pretty dress and I love your accessories! I love this dress!!! Looks so cute with the boater hat! This dress is too pretty! I love the casual fit and pattern! 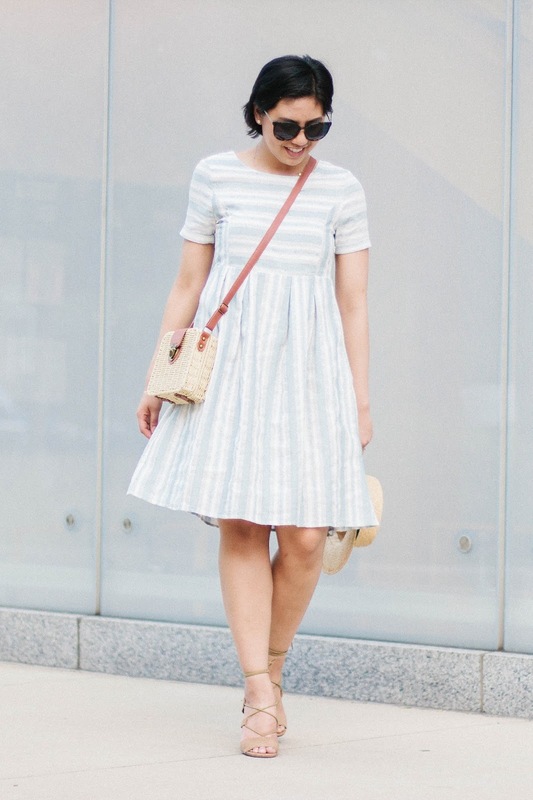 This dress is gorgeous & super obsessed with your bag! 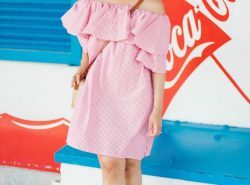 this is the perfect dress for summer!!! love! That crossbag is adorable. What a cute beachy outfit!